Thread: Dusty on the road? If I read the post correctly ,Dusty Boots should be on the road today.Traveling to get the new camper.I hope all goes well and Dust enjoys his trip and the new camper. Re: Dusty on the road? Yup ... Out the door at 4:30. Been running in the rain since 5:30 until now. 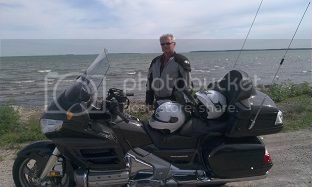 Currently in Blind River, ON, about 1 1/2 hrs to the Soo where I will cross over. Having a coffee and doing emails at the Timmie's here. You are a riding machine be careful and watch out for them border guards. Keep the rubber on the road bud Have fun on your ride and post pictures of your camper when you get it. Sun is shinning and wind is gusting, Nice to be able to warm up basking in the sun. Pretty cool riding, especially before noon. There is some kind of Fair going on in town here and the campground is pretty busy/almost full. 3 Young laddies liked my strange looking 'tent', so I gave 'em a tour! Oh ... and their Mom too!! I am glad to hear you are at a campground and set up for the night.Maybe you will be done with the rain the rest of the trip. I can ride in the rain and ride in the cold,but I don't like to ride in both at the same time. So is this how you plan to stay warm? Be safe out there Dusty, post us some pics if you have time.